Great vid Peter. 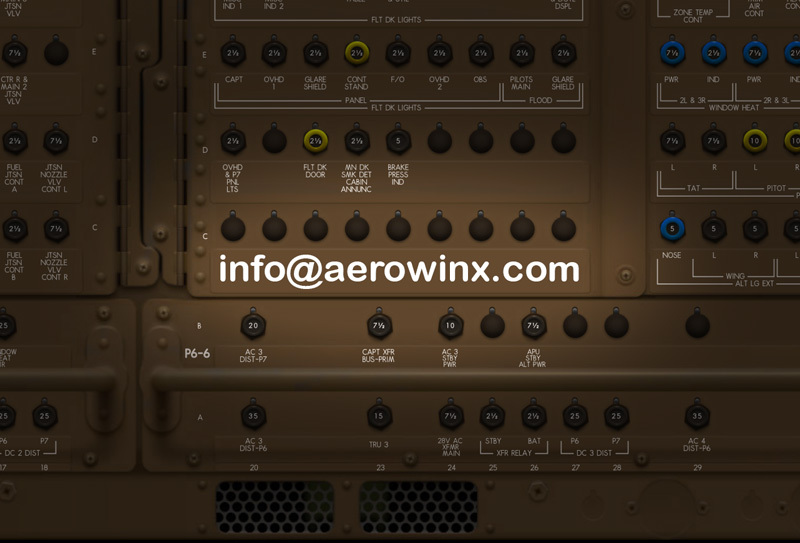 Not sure if you know but Blackbox711 the resident A320 Capt on Twitch used your profiles/legs on stream last night in the FS labs and it worked a treat! Having done LOWI myself I can't imagine what i'd find on the seat after an approach like that. Which leads me onto how PSX models the weather in such conditions? The surrounding mountains create some funky winds in these parts of the world. Thanks for the pointer - yes, he did use my profiles didn’t he! The whole FS community will be at it now! Available in the first post on this thread. I hope you find it useful..
Wow.. thanks, Peter, great detail... Learned a lot. Regarding your comments at 17:30 in the video (Systems 1 & 4 affecting reversers). I'd say it's related to the air-ground logic in the Proximity Switch Electronics Unit (PSEU). For many aircraft systems, main landing gear bogey un-tilt is used in the aircraft-on-ground logic. With no hydraulics on 1 and 4, landing gear bogey tilt is not assured (as tilting requires hydraulics). If hydraulics are not available, the PSEU is automatically commanded to use nose gear strut compression as the on-ground logic. Nice video, Peter -- as usual! On your shopping list at the end, did you mean to list the C A/P for system 1 loss? Good spot, Jon! No I didn’t! - it’s nice to know someone is paying attention! Clear and useful addition to the library ! With no hydraulics on 1 and 4, landing gear bogey tilt is not assured (as tilting requires hydraulics). If hydraulics are not available, the PSEU is automatically commanded to use nose gear strut compression as the on-ground logic. I did not know that was the reason for no reverse with hydraulics out on 1 & 4. Thanks, John. I’ve updated the video wrt the above posts..Thanks! Regarding fuel jettison: Do all the fuel pump switches go on (inc center and stab pumps - something to do with over ride pumps?) How do you prevent a fuel imbal during jettison? Tanks 1 & 4 don't seem to empty whilst 2 & 4 do. The OVRD/JETT pumps are switched on for all tanks which contain fuel. Fuel balancing is automatic while there is fuel in numbers 2 & 3 tanks, provided that you have armed the jettison system. You won’t see the fuel reduce in tanks 1 and 4 unless tanks 2 or 3 get down to 9 tonnes, when the transfer valves open draining fuel from the outboard tanks into the inboard tanks. At this stage you will probably get a fuel imbalance. Any realistic situation where you would want to go that low anyway? I understood that you mostly dump fuel to get just below maximum landing weight. Probably you would dump more if you go gear-up landing or whatever bad, but not usually? As you say a usual starting point would be MLW. 2-engines inop would be the most likely scenario for going below. In freighter operations, a 250,000 pound payload will get you close to the max ZFW (610,000). The max landing weight is 652,000; so, this would be a situation where dumping down to 40,000 might be required. I sometimes do an approach and usually turn off AP and AT. If I do a go around when should I turn on the autothrottle and use FLCH to manage climb? Thanks for all your knowledge you share with us. If you go-around using the TOGA switches the autothrottle will engage anyway, and this should be your preferred method. Any time you press FLCH the autothrottle will also engage. Further climb can be managed either with the method that I show in the Go-around video, (FLCH) or by engaging VNAV assuming that you have a suitable profile in the FMC. Pressing VNAV or FLCH will enable you to manage the speed accordingly, with the speed window open. The height at which you decide to start this acceleration phase will vary with airport (eg if high ground or a tight turn is needed) but will usually take place at 1000ft above airport level. You have to work this out for yourself! Autopilot can be re-engaged any time above the 250ft agl limitation, but in practice you can engage it just above the ground if you feel lazy! How do I PM you? It's regarding the BA sim. I have a question for you (off topic). Could you answer me via my e-mail?